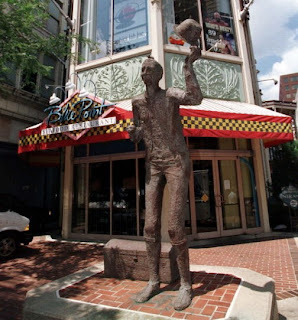 The Richmond City Public Art Commission has issued a Request For Proposal (RFP) for the suitable public placement of a sculpture by John Temple "Jack" Witt called Mr. Smedley. Mr. Smedley is an eight feet tall bronze sculpture of a tall lanky smiling entertainer, doffing his hat revealing a mouse on his head. It is also called "The Street Entertainer." The statue was formerly at the 6th Street Market in 2004 and is currently being stored at a City facility. The city will transport and install the sculpture at the selected location. There are restoration costs ($1500) and an anonymous donor has been found to help defray some of those costs. Mary Field has copies of the RFP if you would like to see it. It can also be found online. Wow! Now THAT was a picnic! We had a Super turnout and the weather couldn't have been better - thanks to all who came out for the summer picnic at Jefferson Park! A BIG THANKS to: - Matt Conrad, Lora Toothman and Dan Russell who brought their grills for use at the picnic - Dan Russell, Adam Wu and Bob James for being our Grill Masters - they were grilling up the dogs and burgers throughout the event and we couldn't have done it without them! 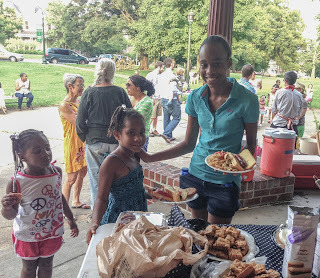 Our annual community picnic in Jefferson Park is Wednesday June 19 at 7pm. Hot dogs, burgers (veggie options) along with drinks will be provided by a generous donor. If you last name begins with A-M please bring a side dish to share, a desert if you're N-Z. See you in the park! Calling all Grill Masters and Mistresses! Our annual Union Hill Picnic in Jefferson Park is Wednesday June 19 at 7pm. We're roundin' up some grills and people who like to cook food on grills. We know you're out there--we've smelled your cooking in the 'hood. Contact Stacey Moulds at semoulds@gmail.com if you'd like to volunteer your cooking skills and/or grill. Thanks!